Adam Hague (Dearne ALC) continued his relentless progress in the pole vault with a win at an international indoor meeting in Vienna on Saturday. Hague, still only 17, cleared a new personal best height of 5.55 adding four centimetres to his previous best set recently in Sheffield. He cleared it first time before going on to fail at an ambitious 5.65, a height only ever beaten by three British athletes. As it is, Hague’s 5.55 is 10th on the UK all-time list, a list headed by his training partner Luke Cutts with 5.83. 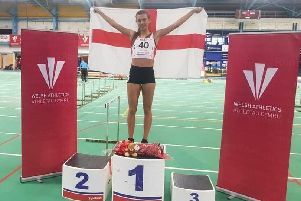 Sheffield-based Louise Bloor (Trafford AC) won the 200 metres in 23.64, an indoor personal best, after finishing runner up in the 60 metres in another best of 7.37. And City of Sheffield all rounder Daniel Gardiner won the long jump, his 7.60 winning effort coming with his last jump. Running for Sheffield Hallam University, Andy Heyes finished fifth in the British Universities Cross Country Championships at Brighton on Saturday. Running for Sheffield University, Steve Bayton finished 16th. Following her Northern Cross Country victory last week, Hallamshire’s Tilly Simpson switched to the track to win another title at the Northern Indoor under 15 and under 13 championships at the EIS yesterday. Following a quick heat of the under-15 800 metrers, she broke the championship record in the final clocking a personal best of 2:10.88 to win by 10 seconds. Under 13 Boys High Jump: 1 N Ramsay (City of Sheffield) 1.45; 3 C Butley (City of Sheffield) 1.20. Long Jump: 3 C Hay (City of Sheffield) 4.64; Shot: 3 N Ramsay (City of Sheffield) 5.83. Under 15 Girls: 200: 2 E Booker (Rotherham) 25.95; 3 R Rodgers (City of Sheffield) 26.46. 800: 1 T Simpson (Hallamshire) 2:10.88; 2 E Wilkinson (City of Sheffield) 2:20.60. High Jump: 1 N Lannie (Doncaster) 1.41; 2 H Slide (City of Sheffield) 1.35.